THE HAGUE, Netherlands -- Former Bosnian Serb President Radovan Karadzic, one of the chief architects of the slaughter and devastation of Bosnia's 1992-95 war, was sentenced to life imprisonment Wednesday as United Nations appeals judges upheld his convictions for genocide, crimes against humanity and war crimes. Survivors of the conflict who packed into the Hague courtroom's public gallery, separated from Karadzic only by a wall of glass, erupted into applause then streamed outside weeping and hugging one another. The prosecutor who worked doggedly for a decade to convict Karadzic welcomed the rulings, saying they should prove even to Karadzic's supporters back in Bosnia that he is no hero. "This trial has proven the opposite," said Prosecutor Serge Brammertz. "Karadzic will be remembered by history as a war criminal responsible for horrific human suffering." The war in Bosnia was Europe's bloodiest conflict since World War II, leaving 100,000 dead and millions homeless. Karadzic's lawyer, Peter Robinson, said the disgraced leader accepted "moral responsibility" for the suffering in the war. But he said Karadzic insisted after the hearing that "politics triumphed over justice today. The appeals chamber whitewashed an unjust trial and an unfair verdict." 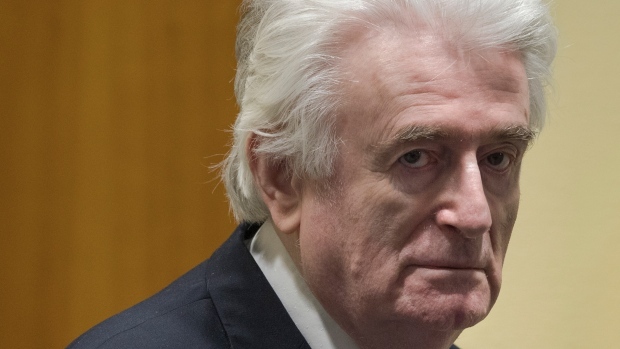 Joensen said Karadzic's original 40-year sentence, handed down in 2016, "underestimates the extraordinary gravity of Karadzic's responsibility and his integral participation in the most egregious of crimes." "Considering what he's done, even if he had a thousand lives, and each one of those thousand lives was taken away from him, it would be not enough for the victims," said Munira Subasic of the Mothers of Srebrenica group. "The victims can never be happy. How can I be happy? My son was killed by Mladic."